Experiencing disturbing episodes of déjà-vu, eleven year old Tom believes he is going mad. Then, he meets the adventurer Septimus Mason, who shows him that he is a “Walker” – someone who can transport himself to other times and places. Septimus explains that these abilities could be removed leaving him, once more, an ordinary schoolboy. Given the hurt these talents have caused, the choice would seem easy enough, but it is not so simple. In dreams, Tom has experienced life as other “Walkers” in times of mortal danger: Edward Dyson killed at the Battle of Isandlwana, 1879; Mary Brown who perished in the Great Fire of London, 1666; and finally Charlie Hawker, a sailor who was drowned on a U-boat in 1943. Tom’s troubles have only just started, however, for he has now drawn the attention of powerful individuals who seek to use him to change history and to bend it to their will. This leads to a struggle wherein Tom’s family are obliterated from existence and Tom must make a choice between saving them and saving his entire world. 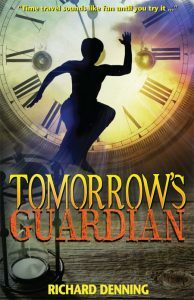 The Hourglass Institute Series is a Time Travel adventure for Young Adults: Time Travel Sounds like fun until you try it. Prepare yourself for a thrilling dash through history as your read about the adventures of Tom and the Hourglass Institute.